So yesterday I preached that great passage from 1 Corinthians. 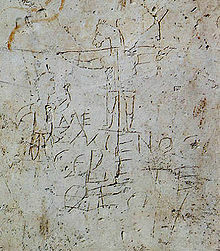 Alexamenos Graffiti: “Alexander worships his god” who is portrayed as a crucified donkey. The sermon juked and jived around the paradox of God’s foolishness compared with the world’s wisdom. I put on display ancient Roman graffiti, read from Richard Dawkins, and swiped an idea from Tim Keller. 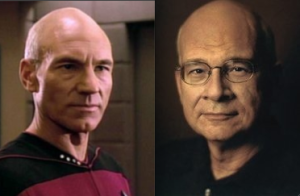 By the way, Tim Keller is Captain Picard. The real heart of the sermon, at least what I was trying to convey, is that the accepted worldview of most people rotates around power, money, and pleasure. The wise thing to do, most people think, is to arrange their life so that they have the most power, money, or pleasure, or all three if possible. There is a possible fourth goal for people today, and that is fame. People will do anything to be famous, it seems but I think that is really a subset of power and pleasure. Most people falsely believe that being famous is synonymous with the good life. I think they are wrong. The foolish virtues of the cross, of the gospel, are the opposite of these. The cross calls us to worship (a laying down of power and control), sacrifice (giving away our resources) and love (wanting others to experience pleasure and joy). I had to keep hacking the sermon like a lumberjack because it was too long. One of the issues I wanted to address, but just couldn’t is that the power, money, pleasure business makes a mess of the world, but it also makes a mess when the church adopts it as a strategy. I firmly believe it is the ruination of a local congregation when it begins to make decisions about its ministry based on power (size, influence), money (can we afford it, look how much we have, how much can we get), and pleasure (we do these ministries because we like them). Time and time again churches follow the wisdom of this age which is real foolishness. I know that in the past I have been guilty of this trap in leading our congregation. Our denomination thrives on telling smaller congregations that they must be bigger (power), take in more money (money), and make people feel relevant (pleasure) and I’ve bought that line far too much. The longer I do ministry and the more I encounter people in need of spiritual vitality the more I have decided that we don’t need bigger churches with more influence, we need churches that make people spiritually bigger and spiritually connected. If a church gets bigger doing those things, that is fine. Likewise, a church does need to be wise about the ways of the world and update its ministry and employ tested and validated methods of reaching and engaging people. However, the goal–the motive–and the reason–these can never ever be to be bigger, richer, or achieve self-gratification. When those motives creep, revival and reformation is needed. Well said Jamie.. Thank You..